Ginger Rogers led a life of confidence that inspired many people during her long acting and dancing career. We can learn from her and other confident women during Women’s History Month. 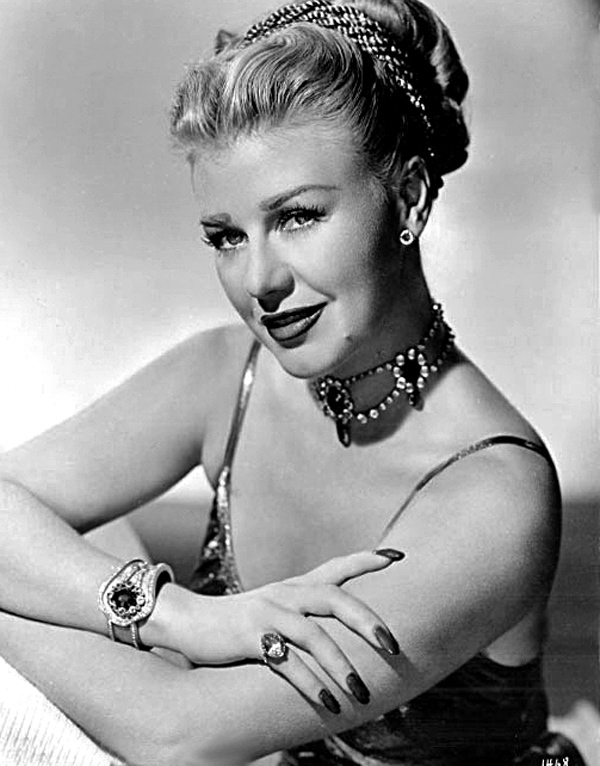 Watching late night TV in the 1980s – as an awkward girl in a flannel nightgown covered with Oreo cookie crumbs – I beheld Ginger Rogers’ lithe, chic form in an elegant ballroom gown, sauntering effortlessly between rooms that looked as if they could only exist in someone’s imagination. Doddering old men and preposterous society matrons populated the slick, black and white world of the old movie The Gay Divorcee, but Ginger wasn’t anything like them. She smirked at them with the playfulness of youth. In her eyes was a flinty self-confidence; in her walk was a dreamy kind of swagger. She was a girl at heart – like me. And she seemed to know a secret that I decided I had to find out. At that moment, I had discovered a woman who would change my life for the better. Ginger danced confidently through movies, and she did the same in real life. Her confidence inspired me to pursue my own goals in journalism. Ever since my parents’ divorce when I was 7 year old, I had made a habit of retreating from the world into my own thoughts as often as possible. As a preteen watching Ginger onscreen, I discovered that there was an intriguing figure whose life I felt I had to delve into, to find out just as much about myself as I could about her. “That’s nice,” Mom would say, in a polite but annoyed tone of voice. It was Ginger’s confident spirit that had first intrigued me as I watched her onscreen, and that same spirit – a serene sort of grace mixed with raw determination – was reflected in her life. She embodied confidence at work. I latched onto her example, eager to see how she had lived every moment. Ginger’s values defined her work, motivating her to do her very best in a wide range of roles over several decades. She could play a wisecracking chorus girl just as well as a tenderhearted waif. She wasn’t an unapproachable artistic genius who, like Garbo, “vanted to be alone.” She was, instead, a regular person who confidently did her best to portray a myriad of characters she seemed to understand instinctively. Studying Ginger’s life and career, I had the advantage of having been born after much of it had already occurred. From my vantage point, I could see how Ginger – who, years ago, had been a shy young girl just like me – had become an accomplished, composed woman able to affect millions through her work. I saw her as an ingénue who hadn’t yet found her niche in a Hollywood where “talkies” were just coming into being. I saw her at the zenith of her career, adored the world over for her teaming with Fred Astaire, and the successful comedies and dramas she made without him. And I saw her plug away after the studio system crashed in the 1960s and old Hollywood faded away, devoting more and more time to the stage and never losing her spirit or her grace. I saw all this at a time in my own life when I needed to figure out how things were going to be for me. I wasn’t like the cool kids, who raved about the adventures of Indiana Jones or the hair on Tom Selleck’s chest. I had no interest in Duran Duran, and Michael Jackson’s appeal was lost on me. I’d felt isolated from my peers for most of my childhood, moving from house to house after my parents divorced and always having to be the new kid. But somehow, it had never bothered me much. I was an introvert. I was a loner. Yet someday I knew I’d find a best friend who I could relate to well. In Ginger, I felt I’d found her. But the truth was, I’d found a part of myself I didn’t know existed: A confident woman who wanted to emerge from the shell of a shy girl. It was the part that made me believe in myself enough to work toward my goal of succeeding in journalism as Ginger had in show business. It was the part that gave me the courage to express myself without fear of being called different, or (God forbid) a “dweeb.” And it was also the part that walked me to the door of the Pension Building in downtown Washington, D.C. to meet Ginger face-to-face. I had heard she was going to be honored by the American Film Institute (AFI) at a special event, so with the same determination I admired in Ginger, I’d called AFI officials, persuaded them to send me an invitation, saved money for a ticket, and talked my dad into giving me a ride. Once I couldn’t walk into a classroom without biting my nails. Now I could attend a black tie gala like Cinderella at a ball – a young girl in the midst of the power elite. When I saw her, she smiled as if to say she understood. I smiled back, readying myself to deliver a long speech I’d practiced for hours before the gala. “Miss Rogers,” I had rehearsed, “you’ve been such an inspiration to me. I’ve watched so many of your movies. These are some of my favorite moments of yours to watch onscreen…”. All I actually said was: “Miss Rogers, my name is Whitney and I’m excited to meet you.” It could’ve been worse. Except that she didn’t hear me. “You’re a what, dear?” she asked, leaning forward with a quizzical expression on her face. I’d met my role model but had failed to express myself to her. I’d thought this might happen, and imagined that if it did I’d just turn around and run, and keep on running until I’d run the whole 17 miles back to my home in Virginia. But something strange happened. For the first time in my life, I wasn’t nervous. In fact, I was confident – just like Ginger. “That’s good, dear,” she said, simply. And it was – because I was no longer an introverted girl, unsure of everything in life. I was me, and I wasn’t afraid to keep exploring what that meant – thanks to a star from the silver screen who showed me what confidence looked like. Ginger and I were to correspond and meet several more times throughout my teens and 20s. By the time she passed away and the world celebrated her career, I had started my own career as a journalist. My work gave me many opportunities to learn and communicate the stories of inspiring women. It was Ginger who showed me how to follow in her steps with the confidence to live my own story well.